Epiglottitis, also termed supraglottitis or epiglottiditis, is an inflammation of structures above the insertion of the glottis and is most often caused by bacterial infection. Before widespread Haemophilus influenzae type b (Hib) vaccination, H influenzae caused almost all pediatric cases of epiglottitis. Affected structures include the epiglottis, aryepiglottic folds, arytenoid soft tissue, and, occasionally, the uvula. The epiglottis is the most common site of swelling. 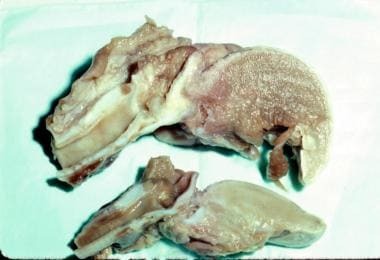 Acute epiglottitis and associated upper airway obstruction has significant morbidity and mortality and may cause respiratory arrest and death. The following image illustrates the difference between a normal pediatric airway and one from a child with fatal epiglottitis. Comparison of a normal pediatric airway (bottom) and airway from a child who died from epiglottitis (top). As with many other aspects of the pediatric airway, the epiglottis is significantly different in the child than in the adult. In the infant, the epiglottis is located more anteriorly and superiorly than in the adult, and it is at a greater angle with the trachea. The infant epiglottis is also more omega shaped and floppy than the more rigid, U-shaped epiglottis in the adult. Haemophilus influenzae type b (Hib) or Streptococcus pneumoniae (see Etiology) can colonize the pharynges of otherwise healthy children through respiratory transmission from intimate contact. These bacteria may penetrate the mucosal barrier, invading the bloodstream and causing bacteremia and seeding of the epiglottis and surrounding tissues. Bacteremia may also lead to infection of the meninges, skin, lungs, ears, joints, and other structures. Hib infection of the epiglottis leads to acute onset of inflammatory edema, beginning on the lingual surface of the epiglottis where the submucosa is loosely attached. Swelling significantly reduces the airway aperture. Edema rapidly progresses to involve the aryepiglottic folds, the arytenoids, and the entire supraglottic larynx. The tightly bound epithelium on the vocal cords halts edema spread at this level. Frank airway obstruction, aspiration of oropharyngeal secretions, or distal mucous plugging can cause respiratory arrest. Historically, Haemophilus influenzae type b (Hib) was the predominant organism (>90%) in pediatric epiglottitis cases. Since the widespread use of the Hib vaccine, the incidence and causative agents of epiglottitis have changed; however, even vaccinated children can develop epiglottitis due to non – type b H influenzae. Clearly, epiglottitis due to Hib persists in parts of the world where Hib vaccination is not used. Although viruses normally do not cause epiglottitis, a previous viral infection may allow bacterial superinfection to occur. Viral agents may include herpes simplex virus (HSV), parainfluenzae virus, varicella-zoster virus (VZV), human immunodeficiency virus (HIV),  and Epstein-Barr virus (EBV). Varicella can cause a primary or secondary infection often with group A beta-hemolytic streptococci. Noninfectious etiologies include thermal injuries, trauma-causing blind finger sweeps to remove a foreign body from the pharynx, angioneurotic edema, hemophagocytic lymphohistiocytosis,  and acute leukemia. Lymphoproliferative diseases may also cause epiglottic swelling. Historically, acute epiglottitis was most common in children aged 2-4 years. The use of the Haemophilus influenzae type b (Hib) vaccine has reduced incidence of epiglottitis in the United States, making this a rare condition in children. Introduction of the polysaccharide vaccine in 1985, followed by the highly effective conjugate vaccine, dramatically reduced the incidence of epiglottitis, with concomitant declines in hospital admissions. Studies have shown an annual incidence rate of 0.63 cases per 100,000 persons,  and studies of children of all ages with epiglottitis report a seasonal variation in incidence. A comparison made between a large US children's hospital's chart review from 1995 to 2003 and a previous report from the same hospital completed 27 years earlier, showed a 10-fold decline in acute epiglottitis admissions, with streptococci becoming the major pathogens. Epiglottitis incidence in adults has remained constant. Most studies show no racial predominance for epiglottitis, although a recent study showed higher incidence among black and Hispanic individuals. There also appears to be a 60% male predominance, which has remained true even with the changing epidemiology of epiglottitis. Epiglottitis was once believed to occur exclusively in children. In the past, this condition occurred most commonly in children aged 2-4 years; however, it may occur at any age. Adult cases have been reported in recent years, and some evidence suggests the incidence in adults is increasing. The prognosis is good for patients with epiglottitis whose airways have been secured. The mortality rate is less than 1% in these patients. However, mortality rates as high as 10% can occur in children whose airways are not protected by endotracheal intubation. During the bacteremic phase of the disease, other foci of infection are possible. Pneumonia is the most commonly cited associated illness, followed by otitis media. Meningitis has also been reported in association with epiglottitis. As with other causes of upper airway obstruction, pulmonary edema can be observed after the airway has been secured. Accidental extubation and respiratory arrest are the 2 most common complications, and accidental extubation can cause additional complications. Cervical adenitis, tonsillitis, and otitis media have also been documented. For patient education information, see Cold & Flu Center as well as Epiglottitis. Kamienski M. When sore throat gets serious: three different cases, three very different causes. Am J Nurs. 2007 Oct. 107(10):35-8. [Medline]. Aravapalli S, Sahai S. Haemophilus influenzae type b epiglottitis in a 3-year-old boy. Consult Pediatr. June 2013. 12(6):263-5. Tebruegge M, Connell T, Kong K, Marks M, Curtis N. Necrotizing epiglottitis in an infant: an unusual first presentation of human immunodeficiency virus infection. Pediatr Infect Dis J. 2009 Feb. 28(2):164-6. [Medline]. Kong MS, Engel SH, Zalzal GH, Preciado D. Necrotizing epiglottitis and hemophagocytic lymphohistiocytosis. Int J Pediatr Otorhinolaryngol. 2009 Jan. 73(1):119-25. [Medline]. Adams WG, Deaver KA, Cochi SL, et al. Decline of childhood Haemophilus influenzae type b (Hib) disease in the Hib vaccine era. JAMA. Jan 13 1993. 269(2):221-6. [Medline]. Frantz TD, Rasgon BM. Acute epiglottitis: changing epidemiologic patterns. Otolaryngol Head Neck Surg. Sep 1993. 109(3 Pt 1):457-60. [Medline]. Faden H. The dramatic change in the epidemiology of pediatric epiglottitis. Pediatr Emerg Care. 2006 Jun. 22(6):443-4. [Medline]. Hopkins A, Lahiri T, Salerno R, Heath B. Changing epidemiology of life-threatening upper airway infections: the reemergence of bacterial tracheitis. Pediatrics. 2006 Oct. 118(4):1418-21. [Medline]. Guldfred LA, Lyhne D, Becker BC. Acute epiglottitis: epidemiology, clinical presentation, management and outcome. J Laryngol Otol. 2008 Aug. 122(8):818-23. [Medline]. Devlin B, Golchin K, Adair R. Paediatric airway emergencies in Northern Ireland, 1990-2003. J Laryngol Otol. 2007 Jul. 121(7):659-63. [Medline]. Ehara H. Tenderness over the hyoid bone can indicate epiglottitis in adults. J Am Board Fam Med. 2006 Sep-Oct. 19(5):517-20. [Medline]. Lee DR, Lee CH, Won YK, Suh DI, Roh EJ, Lee MH, et al. Clinical characteristics of children and adolescents with croup and epiglottitis who visited 146 Emergency Departments in Korea. Korean J Pediatr. 2015 Oct. 58 (10):380-5. [Medline]. Glynn F, Fenton JE. Diagnosis and management of supraglottitis (epiglottitis). Curr Infect Dis Rep. 2008 May. 10(3):200-4. [Medline]. Grover C. Images in clinical medicine. "Thumb sign" of epiglottitis. N Engl J Med. 2011 Aug 4. 365(5):447. [Medline]. Acevedo JL, Lander L, Choi S, Shah RK. Airway management in pediatric epiglottitis: a national perspective. Otolaryngol Head Neck Surg. 2009 Apr. 140(4):548-51. [Medline]. Bizaki AJ, Numminen J, Vasama JP, Laranne J, Rautiainen M. Acute supraglottitis in adults in Finland: review and analysis of 308 cases. Laryngoscope. 2011 Oct. 121(10):2107-13. [Medline]. Briem B, Thorvardsson O, Petersen H. Acute epiglottitis in Iceland 1983-2005. Auris Nasus Larynx. 2008 May 22. [Medline]. Chiou CC, Seibel NL, Derito FA, Bulas D, Walsh TJ, Groll AH. Concomitant Candida epiglottitis and disseminated Varicella zoster virus infection associated with acute lymphoblastic leukemia. J Pediatr Hematol Oncol. 2006 Nov. 28(11):757-9. [Medline]. D'Agostino J. Pediatric airway nightmares. Emerg Med Clin North Am. 2010 Feb. 28(1):119-26. [Medline]. Duval M, Daniel SJ. Guillain-Barre syndrome presenting as epiglottitis in a child. Otolaryngol Head Neck Surg. 2010 Apr. 142(4):632-3. [Medline]. Jenkins IA, Saunders M. Infections of the airway. Paediatr Anaesth. 2009 Jul. 19 Suppl 1:118-30. [Medline]. Katori H, Tsukuda M. Acute epiglottitis: analysis of factors associated with airway intervention. J Laryngol Otol. 2005 Dec. 119(12):967-72. [Medline]. Leboulanger N, Garabedian EN. Airway management in pediatric head and neck infections. Infect Disord Drug Targets. 2012 Aug. 12(4):256-60. [Medline]. Martin S, Waters K, Perez MK, Kleman BT, Nield LS. Index of suspicion. Pediatr Rev. 2009 Mar. 30(3):107-13. [Medline]. Murphy TV, White KE, Pastor P, et al. Declining incidence of Haemophilus influenzae type b disease since introduction of vaccination. JAMA. Jan 13 1993. 269(2):246-8. [Medline]. Nozicka CA, Naidu SH, McFadden J. Varicella-associated acute supraglottitis. Ann Emerg Med. 1994 Apr. 23(4):888-90. [Medline]. Rogers DJ, Sie KC, Manning SC. Epiglottitis due to nontypeable Haemophilus influenzae in a vaccinated child. Int J Pediatr Otorhinolaryngol. 2010 Feb. 74(2):218-20. [Medline]. Shah RK, Stocks C. Epiglottitis in the United States: national trends, variances, prognosis, and management. Laryngoscope. 2010 Jun. 120(6):1256-62. [Medline]. Shah S, Sharieff GQ. Pediatric respiratory infections. Emerg Med Clin North Am. 2007 Nov. 25(4):961-79, vi. [Medline]. Snyder SR, Kivlehan SM, Collopy KT. What's behind stridor? Case studies in diagnosis and care. Airway obstruction could be imminent with this alarming sound. EMS World. 2013 Jan. 42(1):30-1, 33-4, 36 passim. [Medline]. Tibballs J, Watson T. Symptoms and signs differentiating croup and epiglottitis. J Paediatr Child Health. 2011 Mar. 47(3):77-82. [Medline]. Swollen epiglottis with characteristic thumbprint sign. Child assuming the sniffing position with upper airway obstruction. Radiograph of a child with acute epiglottitis; note the hypopharyngeal dilatation, obliteration of the vallecula, and thickened aryepiglottic folds—a positive thumb sign. Child with acute epiglottitis after intubation. Note cherry red epiglottis. This image was taken in 2008 and the child was completely immunized and grew HiB from surface culture.